You may of seen the new Lebron James and Johnny Manziel commercial. If you thought that was cool, wait till you hear this. 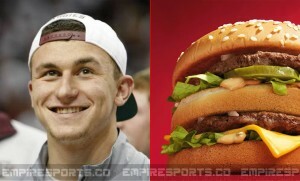 McDonalds declared that they are releasing the new Jonnhy Mac Burger some time this year. The Johnny Mac Burger is going to fit the snack category. For someone who just has pocket change with them, and wants a small bite to eat. Not that filling but still holds all the flavor. It will be a nice option when your not hungry but fill like something delicious. It’s no surprise that the first corporate sponsor to offer Johnny Football a contract is McDonald’s. The fast food chain is the mirror image of Manziel, both fast and overrated. McDonalds stated if the Johnny Mac burger proves to be successful, don’t expect them to stop there. They likely will create more food options based on athletes. With one likely candidate being Lebron’s Slam Dunk Feast. You could probably imagine what that meal would have in it. Athletes can be popular role models, and a lot of fans will be eager to try the food choice of a favorite player. Now the question is will the burger be a boom or a bust. Guess we’ll find out soon enough.